Perfect for displaying collectibles, decorative pieces, or framed photos, this item features touch lighting to brighten any entertainment unit. Use it to highlight displayed items, or as a subtle and safe light for when you want to watch a movie in the dark. Touch lighting allows you to turn the lights on and off with ease, conveniently located so that you won’t have to reach around and risk damaging your prized items. With this extensive collection, you can find charming Farmhouse style for every room in your home. This TV wall brings cozy and welcoming style to your living room or entertainment area. It features touch display lighting and adjustable shelving to accommodate your TV and decorative accents. Crafted from distressed oak and birch veneers with an antique white finish. 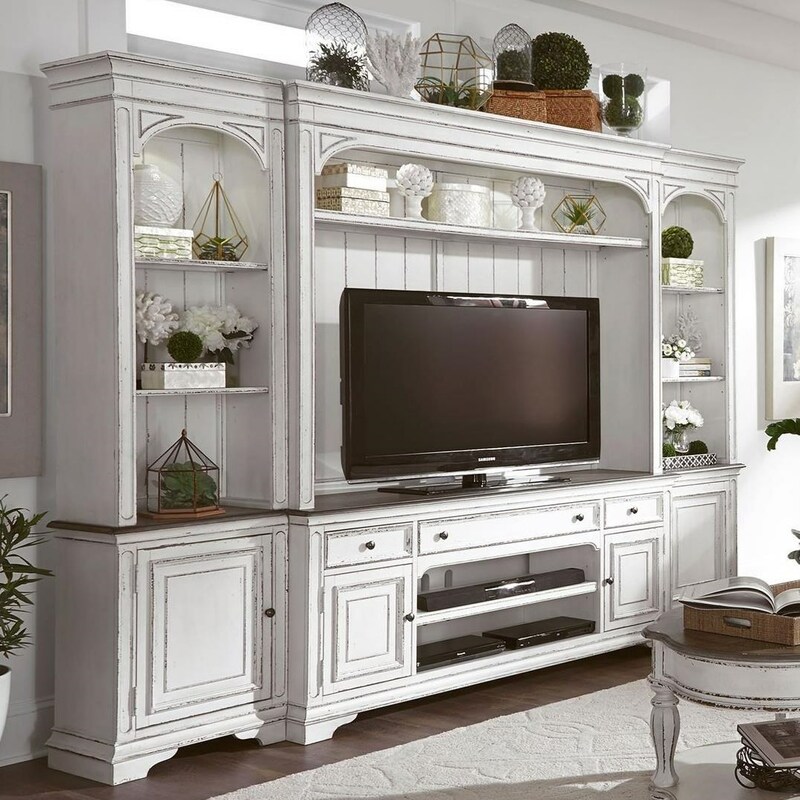 The Magnolia Manor 4 Piece Entertainment Wall Unit by Liberty Furniture at Zak's Home in the Tri-Cities, Johnson City, Tennessee area. Product availability may vary. Contact us for the most current availability on this product. Storage Three drawers. Two cabinets. Open sound bar storage at center with one adjustable shelf. The Magnolia Manor collection is a great option if you are looking for furniture in the Tri-Cities, Johnson City, Tennessee area. Browse other items in the Magnolia Manor collection from Zak's Home in the Tri-Cities, Johnson City, Tennessee area.